The November attacks in Paris had an unknown, but quite foreseeable, effect on Italy. Even though the traditional targets (the Vatican, synagogues, metros and stations) are under surveillance, Italian newspapers keep reminding us all that traditional types of terrorism are over and that now everybody is a potential target. And so, therefore, everybody is a potential terrorist. This month, terrorists have been spotted in strange places and situations all over Italy, and the alarm has always been proved wrong. The police may also be looking for terrorists in the wrong places. The government is demonstrating its control of the situation by targeting the “grey zones”, where unknown people live, mainly in Rome. A campaign started to identify all people living in squatted houses. In via Curtatone, 556 Eritrean and Ethiopian people were checked on December 1st, and only four turned out to be illegal. The same happened in Casal Boccone, where 120 families live, some of them immigrants. No-one was arrested or taken away. And it was the same story on December 10th for the 500 people living in Naznet. In Turin at the exMOI squat and at many other smaller centers there was some degree of checking by police. Police even took the time to check all the photos and videos taken at the now-evicted Ventimiglia NoBorders Camp to reassure the population at large. Each time the police gave reassurances that these were anti-terrorism checks, and that no eviction would follow the checks. But terrorism has become the main excuse for tightening control over anti-racist and housing movements, neither surely connected to terrorist attacks. 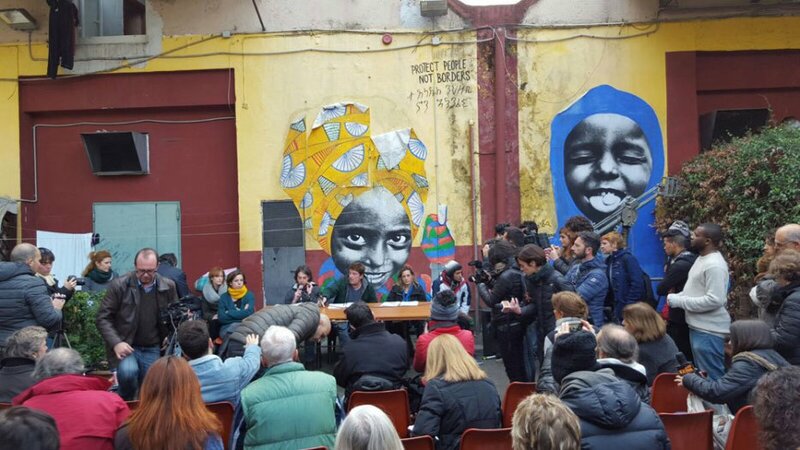 The Baobab center was a volunteer-run immigrant reception center in via Cupa, near Tiburtina Station, that had become central to managing refugee accommodation in Rome after 200 refugees were evicted from Ponte Mammolo camp. When police first raided the Baobab center on November 24, there had already been rumors about eviction. At the time 23 migrants, two of them minors, with no legal papers were taken to the police station. None were found to be terrorists but is highly likely they will be deported as illegal. The action was justified as an anti-terrorism measure because of the Catholic Jubilee Year of Mercy, which began on December 8. The local authority took this opportunity to retake the building, scheduling the eviction promptly for December 9 in order to return it to the owner. The communication about eviction was the only one from the local authority received by the volunteers. At the moment, temporary housing has been provided for most of the center’s residents, and volunteers are waiting for a new building. This is a very controversial case. The authorities could have used this opportunity to work with the center and its volunteers. They did not choose this positive and constructive route: they chose racist profiling, early morning police raids and almost immediate eviction of the residents. Remarkably, Angelino Alfano, Minister of Justice, commented that “police controls at the Baobab center in Rome prove our efficiency in prevention and control”. Clearly the assumption is that immigration and terrorism have an obvious link and that to make citizens safe, squats must be evicted and immigrants be under strict control. A rather unclear link also exists, in the mind of the authorities, between terrorists and school students claiming their rights. School occupations are a “traditional” way for students to protest against school reforms, in this case against the “Buona scuola” Reform; they usually last a few days and do no harm except halting classes. Apparently now, though, the authorities perceive a dangerous link to terrorism. The day before, November 25, the same thing had happened at Mamiani High School in Rome, where students had tried to start an occupation. The headteacher said that she was clearly informed by the prefecture that “any ‘out of control’ act of protest is inappropriate and must not be permitted, especially in a school near to risk areas”. These examples illustrate an interesting, and terrifying, shift in the public debate. On one side Northern League propaganda is now pervasive and uncriticized. The fight against degrado, the neglect and decay reported by the New York Times, provided the reason to post police officers in every underground and station, which has served to increase the pressure on the poorest section of the population. The link between immigration and terrorism has become so unchallenged that the government can praise immigration controls as a success. This builds up and empowers the “frame” of culture clash: we have to defend our Christian roots by celebrating the Jubilee and there must be monitoring of those who do not take part. Rome must be a symbol of a strong, winning government. Meanwhile this is, as always, the easy solution. It gives no real answer at all to students who disagree with school reforms, nor to the countless immigrants and Italians living in squatted houses, and not even to workers at ATAC, the Rome bus company, who have not been paid for months but have been denied the right to strike because of the Jubilee Year of Mercy. In Italy, as in France, terrorism seems a good excuse to put down any form of protest. Originally from the Struggles in Italy blog.